25th May and 1st June: “Testflight out of Time,” a re-enactment of past performances exploring my changing love of dada, within an Exhibition dedicated to the same theme Dunkelholzli Studios, Zürich. Various Dates: Spam & Bass concerts at ZHdK ( Zurich University of the Arts), Paranoia City Bookstore and Ion Gallery Zurich. Spam is read to a bass accompaniment played by Emre Sarigol, so that the sound oscillates between abstract poetry and muzack. 14th February: DADAbend 4 at Cabaret Voltaire organized by DADAmt = St.Pauli. lights and timed acts of six minutes controlled by the audience. 11th November: “Official Handover Ceremony” Post Olympics donation of childhood toothbrush collection (all used) to Arts Collective U5 at Chaos Stage, Loch Squat. 6th May: “Mohrenkopf/Lessinkopf” Free-range GAMESHOW, Perla Mode (as part of Fool for April) A critique of value within the art world with artists, curators and the ‘common arty’ as panelists. 18th December: “Pronunciation” LESSON ONE at the Chorgasse, as Tester lesson using dada and confusion as a tool for learning. 11th November: Wedding “La Fontaine” at the Cabaret Voltaire Wedding of Dionysus and Apollo, a girl who is straight and a man who is gay: a ceremony of true love and celibacy. 27th September: “DADabend 1” at Cabaret Voltaire Celebration for the renewed funding of Cabaret Voltaire. 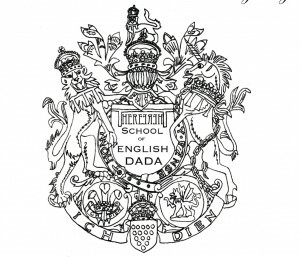 14th May: ENGLISH DADA BREAKFAST “Englischer Morgen mit Dada gepfeffert” at Station21 Art Platform Come fry it up and aid in vital dada research: Why dada never made it to England? 29th April (ROYAL WEDDING DATE): “The ROYAL ACT” at The Cabaret Voltaire It is the Friday night (new bank holiday in U.K,) the unemployed stop working, Prince William marries a commoner, the Queen is “delighted,” the bride wears the ring of the Prince’s dead mother. DADA Siegt! 6th September: COLOUR VERMITTLUNG, Haus Konstruktiv Zurich. Led a tour looking at how Auguste Herbin’s colour palette developed in his early works. June: Tour-Guide for ART UNLIMITED, ART BASEL prepared and gave tours for UBS clients and client advisors, whilst interning at the UBS Art Collection. 22nd March: “The MISTAKEN CLASSROOM” with Sabriye Hutter, a language teacher at ECAP Language Centre, Oerlikon. Installed artworks based on learning German in a classroom of German students. Introduced the works to emphasize the surreal nature of the classroom, focusing on the rift between language and meaning and worked together with the pupils to create an extension of the educative photo series in their textbooks. 8th May: RAW VERMITTLUNG, Haus Konstruktiv Zurich. Led a tour of the gallery interpretating Alex Katz’s paintings, using the movements of a painter and no words. 2009: QUEST FOR PARADISE ARTS GROUP Lecture with Matt Roberts (runs an Organisation and gallery in London helping young artists) to the University of the Arts, London on “The nature of temporary spaces and how to set up your own pop-up-down gallery.” Workshop with the Royal Hospital for Neuro-Disability in Wandsworth. As the Quest for Paradise exhibition space had no wheelchair access, artists worked with the patients and their creative team to make a piece of art akin to one in the Exhibition. This work was then displayed in an odd location within their building to encourage a similar ‘pop-up’ feeling. August 2014: ‘Go Figure’ Group show of new figurative works curated by Roxie Warder at Cob Gallery, Camden London. August 2013: ‘Common Stage’ – Change My Nature Transdisciplinary Project in collaboration with NACTA and ZHdK students – theme pollution, starting point the legends of Jingwei and Yugong. NACTA, National Academy of Chinese Theatre Arts, Beijing, China. August 9- 12th 2012: ‘Hin and Zürich’ Series of narrative balloon and tracing paper works hung alongside paintings ‘Made in Switzerland’, depicting explorations of Zürich at Wäscherai, Zurich. June 2010 – present: ‘Birdom’ Series of pipe-cleaner birds, temporary collection of the RSPB, displayed in the Yan, Grizedale Sculpture Park. November 2009: QUEST FOR PARADISE ARTS GROUP “Addressing the Boredom” Pop-Up Gallery show, 54 West Hill, Wandsworth. April 2009: ‘This is Belgium.’ Show of artist’s memorabilia and memories displayed in Studio One, Wandsworth Art Village inspired by a WWOOFing trip to Belgium. June 2009: Creekside Open Competition, APT Gallery, Deptford. Painting “Boy who cried wolf in Australia” selected by Mark Wallinger.